The Otherlife is a novel about two boys, Ben and Hobie, at two points in time: 2011 and 2008. And, of course, it is a novel about the thing Ben christens "the Otherlife" - an intrusion of elements of Nordic mythology in his vision and life. Tip: Don't read the back cover, as that gives away plot details that take the book about 80% of its length to reveal. We see 2011 through the eyes of Ben, teenager and metalhead, cramming for his GCSEs while struggling with migraines, a habit of taking pills he steals from his mother, and a re-incursion of the Otherlife into his everyday life. It had been absent for two or three years. What kicks the story off is that he receives news that "He is dead", only he does not know whom. For 2011 Ben, it's a story of finding out who dies, and how, and why. But with the return of the Otherlife comes the return of memories, of that fateful time in 2008 which set his fate on its current path. We see 2008 through the diary of Hobie, then-12-year-old rich kid and class bully, who encounters Ben at his elite school and becomes fascinated with the quiet, broken boy who talks of Ragnarok and Viking gods, and eventually, with wanting to see the Otherlife himself. The Otherlife is described as a YA novel, but I have to admit, I did not think it was YA at all, in the same way that I don't think Lord of the Flies is a YA or children's novel. It is a novel about kids, but not, I think, for kids. 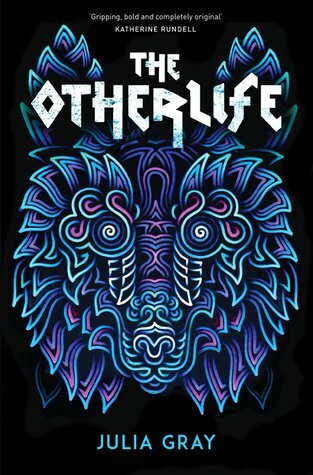 The Otherlife is serious, hyper-authentic, literary, with an sprinkling of the fantastic that is a lot subtler than the stunningly beautiful cover might make you think. It is also complex, complicated, deep, subtle, and patient. As very authentic literary novel, it is a slow-moving beast. We are immersed in Ben's and Hobie's world, which is one of enormous privilege and substantial academic pressure. Ben, whose parents are divorced, can only stay in his school if he exceeds academically to the point of gaining a full scholarship. Hobie, whose parents are multi-millionaire, high society types, is spoiled rotten with material things, brought up to be terrifically arrogant and selfish, but not very academically minded or gifted. He, too, is under pressure to be a scholarship student, but for reasons of (family) pride rather than need. The elite school Hobie and Ben go to is an educational pressure cooker. The kids are stuffed with useless knowledge and exam preparation, most of their conversations are serious and about studying, and they seem utterly dehumanised by the system. At the same time, it is difficult to feel too sorry for them: Hobie reads like a young Boris Johnson, his classmates are the David Camerons and Jacob Rees Moggses of the future, and their lives of mansions and nannies and tutors are made of entitlement and privilege. They are loveless and emotionally cold childhoods. Hobie, especially, is not just a harmless joking toff: he is a vicious bully, who leaves lifelong scars on the souls of some people. His fascination with Ben allows a friendship to bloom, but we're never blind to the horrific psychological abuse he heaps on his sister, or the anger broiling just beneath his skin most of the time. The world the author describes is completely believable. The kids hang around South Kensington, Notting Hill and Camden, complete with visits to shops that actually exist. The people around them are authentic. The school atmosphere felt very familiar. I imagine the author must come from a background quite similar to that of these kids, or she must have spent a lot of time surrounded by kids and people like them. But what about The Otherlife? I admit, I was not expecting to read about the lives and times of some privately educated rich kids quite as much as I did. I thought there would be more fantasy stuff. Ben has certain visions ever since an accidental whack to the head with a cricket bat, which partially blinded him for months, and which resulted in his vision returning with added shiny stuff. It is his tutor who first mentions Viking mythology to him, and Ben starts to fit the colours and visions he sees into a framework he reads about obsessively from that point onwards. It's not quite as simple as "it's all in his head", but for much of the story, the Otherlife is a very passive thing: Ben sees things, but he almost never interacts with them. That said, the Otherlife is very important to the story, and its frame foreshadows and rounds up and completes aspects of the story.